Many of us congregated for lunch. We celebrated our last day as a unified group by sharing our experiences while enjoying kebabs and smoothies in the sunshine. I learned that Uzair was given an hour long, very official presentation at the offices of the biggest engineering companies in Morocco. Aly had coffee with the woman who established an organization empowering local women with skills in sustainable handicrafts. 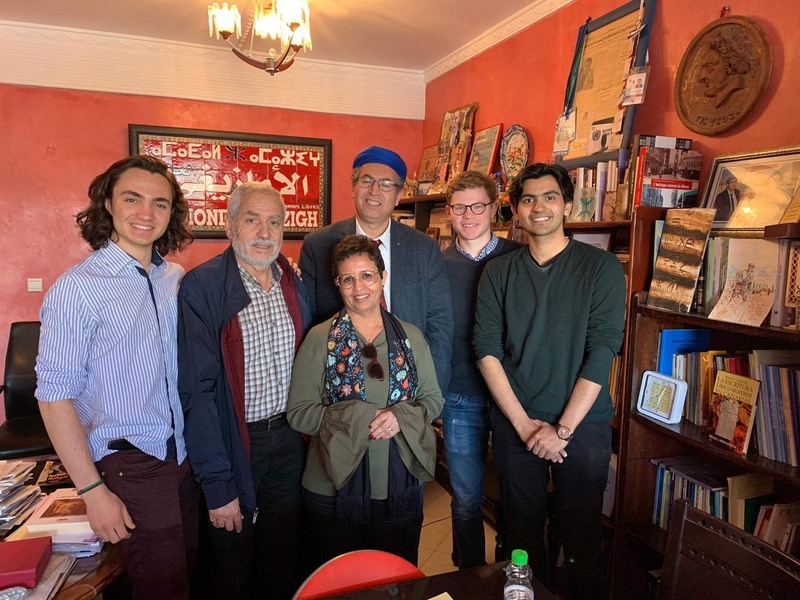 And Vinicius, Atrey, and Taylor met the directors of the only Amazigh newspaper on the African continent. Most importantly, sitting in the sun together reminded me of how tight-knit the group has gotten in the last few days. We laugh and learn together, and I am increasingly grateful for the company of my curious, kind friends on this adventure. Arjun, Reed, Sara, and I went to the Spanish embassy after lunch. The seasoned official we met with spoke at length about Spanish-Moroccan relations and migration, including Spain's investment in Morocco, border laws, the Spanish territories of Ceuta and Melilla, and human rights. The interview was informative and provided a valuable perspective for us to consider. It helped re-focus Arjun's topic on understanding Spanish investment and its relation to Morocco controlling immigration. We returned from the interview in taxis, and I took the time today to chat with the drivers of all the cabs I rode in. They appreciated my attempts to converse in the little Darija dialect I have picked up and we discussed a fascinating array of topics. I learned so much about Moroccan life and culture from these conversations! We returned to the hotel to find some other members of the group assembled and ready to head to the train station. While we waited for everyone to arrive, we talked and ate oranges. We have been eating the sweetest tangerines for the last four days and every day, someone buys two kilos of them. They are all gone by the time dusk falls! Splitting up was bittersweet. Five of us hopped on the train to Fes, while the remaining ten raced to catch the train to Tangier. The latter group, of which I am part, reached our destination at 9.30PM and headed to our hotel. As I write this, we are playing Monopoly in our pyjamas, resting before a long day of meetings in Tangier tomorrow.